When electronics and two-stroke engines are mentioned in the same sentence it can send shivers down the spines of even the most experienced users and mechanics. 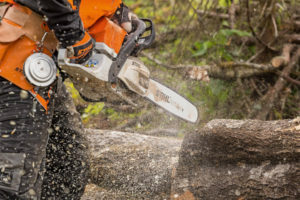 But we want to dispel the myth behind the technology and give you a clear and simple understanding of STIHL’s M-Tronic technology and how it works. M-Tronic is a STIHL engine management system that measures and regulates the fuel and air mix at all times. Much like the technology we see in modern day cars, its main purpose is to ensure that the engine always receives what it needs to perform at its very best. M-Tronic constantly measures internal operating systems as well as external factors such as temperature, elevation and fuel quality. It also has a memory function, which means each time you start the saw (as long as conditions have not changed) the engine will be ready and primed for full performance. What is the physical difference between an engine with M-Tronic and one without? The main mechanical parts you would recognise in a normal working two-stroke engine are all still present and accounted for. There is still a fuel filter, air filter, carburettor, manifold, cylinder, piston, crankcase, crankshaft and flywheel, so mechanically it is the same. Fan wheel – Two pole shoes are built in to the fan propeller and supply the control unit with electricity. 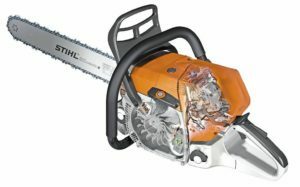 This means the fan propeller not only provides cooling for the engine when you start up your chainsaw, it also generates its own energy supply to power M-Tronic. Ignition module – this now becomes a control unit, or the brains of the tool and features a microprocessor, electronic temperature recognition and ignition system. Carburettor H, L and LA screws are no longer present, these are replaced by a solenoid valve. The electronic solenoid valve takes just milliseconds to feed the correct amount of fuel into the engine as calculated by the control unit so you are getting the best performance fast. 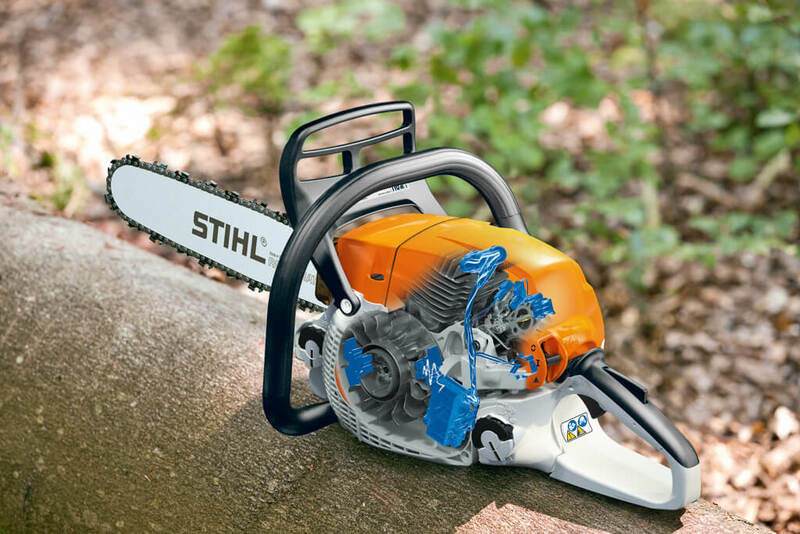 Combi-lever with stop button function – For a cold start, STIHL M-Tronic only needs one start position on the combi-lever. After starting, you can immediately power up to full speed. Addition of a wiring harness, or loom, which links up all the M-Tronic elements. Addition of a micro-switch- The micro-switch registers the position of the choke and, in conjunction with electronic temperature recognition, ensures easy starting throughout the day. Is there any extra servicing required? All the normal servicing and maintenance that is needed to keep your two-stroke tool in tip top condition still applies, so it is important that this is done regularly. If you do encounter any issues, it is always worth bearing in mind the part M-Tronic plays within the system too. For example, the solenoid valve, which is fitted to the carburettor, is directly involved in delivering the fuel/air mix, so it needs to be considered during the diagnosis stage. Also, each M-Tronic machine can be re-calibrated at any time, so if there seems to be something not quite right during operation it is always worth re-calibrating the tool at the first instance. This can be easily done in-situ following the correct procedure within the specific tool owner’s manual, which can be found here. Re-calibration should only take a maximum of 90 seconds to do, although the newer tools are even quicker. For easier starting, it is always worth remembering that the saw only needs to be started in the triangle position on the main control lever, when the engine is cold. Once the machine has been started and used (and the engine is still warm), it should be started in the normal running position (I). Have you got any questions about the M-Tronic engine management technology? What is your experience of tools with M-Tronic? We want your feedback so leave us a comment below. Hi Jonathan, thanks for your feedback – we have updated the post to talk about the starting procedure when the saw is cold or warm! Hope that is useful! Thanks for the detailed explanation of the M-Tronic system operation! A failure of the solenoid valve can cause a “no-spark condition” due to “current loading” of the ignition module. Is this correct? What is the expected DC resistance of the solenoid when measured with an ohm meter? Hi Thomas, I’ve spoken to our Technical Team about this and we have never known of a “no spark” situation caused by the failure of a solenoid valve.